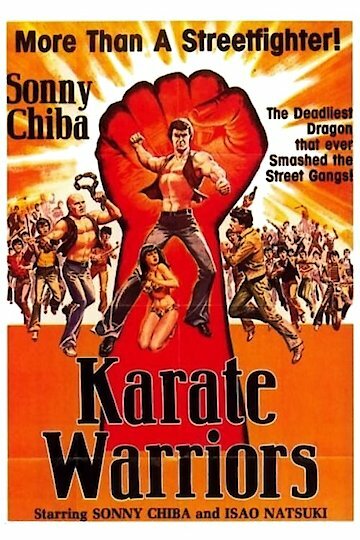 "The Deadliest Dragon That Ever Smashed the Street Gangs!" A lone fist for hire and a drifter, Chieko finds work between two gangs that used to be one. These gangs are warring over territorial as well as seeking the whereabouts of millions of dollars in heroin that has been hidden away in a secret location. Once a single gang, the group split after Kenzo their honorable leader had died, and Koreko who had taken over the gang had been sent to prison for murder just after he became leader of the gang. Koreko is also the one that hid the high dollar heroin. Meanwhile, a ruthless female mobster is playing them all for her own needs. Now a quiet samurai and his son is hanging on to his country's old ways, is working for one of the cartels, while holding on to his courage of the warrior way. The boy is now caught up in this gang dispute as both a pawn and a target of the gangsters. Karate Warriors is currently available to watch free on Tubi TV and stream, download, buy on demand at Amazon Prime, FlixFling, FlixFling VOD, Amazon online.